Today most North Americans are enjoying a beautiful long Fall holiday weekend. In the USA, Monday is Columbus Day, and in Canada this is the traditional Canadian Thanksgiving weekend. 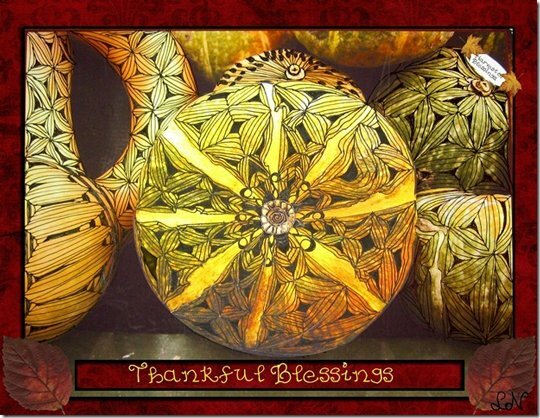 In honour/honor of this occasion when we set aside a special time to celebrate life’s blessings with family and friends, Canadian tangler Anje, from British Columbia, created a beautiful tangled card she shares with us. Anje writes, “In the summer of 2007, my husband and I (soon to celebrate 35 years of married life) fired our corporate bosses and moved back to Vancouver Island, bought a house in a single day with a bit of land, and now watch from our home office window, the giant Douglas Firs dance in the wind. Two years ago, I came across Rick and Maria’s Zentangle site and from there it was an easy hop over to your wonderful site of Tangle Patterns … During this past year, I have been involved with an online digital art forum run by Tangie Baxter called the Art Journal Caravan over at scrapbookgraphics dot com and it was her September Adventure Quest ‘Do a Zentangle Mandala’ that made me buy a good dozen Sharpie fine point pens and create the ‘squash-tang-ala’ using a variation of Carole Ohl’s Tangle: ‘Puf’. There is just something so magical about how the shadowed dimension appears, that so far I have yet to be tired of doing this particular Tangle! Thanks so much for sharing your Zentangle®-inspired creation with us, Anje. Now that you’ve planted the seed, tanglers will be looking at their photos in a whole new way. I am so thankful to be able to spend this special occasion with my amazing family. Separated as we are by a thousand miles, we do not get to see each other as often as we’d like but today we will be celebrating together and counting our blessings. And I am thankful for all your support and appreciation. Whether or not your day is filled with turkey and Fall’s bounty, I wish you a very blessed and HAPPY THANKSGIVING. here’s the quintessential Canadian delicacy for you to enjoy: my Mom’s recipe for Canadian Butter Tarts – we love these on any occasion but they’re an integral part of our Thanksgiving celebrations. Be warned – Butter Tarts are addictive. 5 comments to Happy Canadian Thanksgiving! I think this is just beautiful work. Most impressive. I would love to meet another zentangle enthusias living on Vancouver Island. Thanks so much for posting Anje’s beautiful “squash-tang-ala”. I had been wondering about combing tangling with an old love of doing mandalas. Hers is a gorgeous incentive. I see the pic of Suzanne McNeill’s Zen Mandala book next to this post. Good idea. I’ll order one. And, just so you know, three friends and I, at our dinner down here in Florida last night, toasted the Canadian Thanksgiving. And thanks to your mom for the delish butter tart recipe! Dear Linda, Donna and Karen! Thank you Linda for putting my squash-tang-ala on the site1 Goodness! Looking at what I wrote, gosh I was wordy, wasn’t I? Blessings to you and yours and those BUTTER TARTS! Hi Donna, you can email me at anje@rowantree.ca if you wish to contact me for tangling and coffee! Hello and Blessings to Karen as well for your encouraging comments and of course for toasting us on our Holiday (we will be sure to do the same come Nov. 25 for you). Mmmmm butter tarts. I think I’ll make some for Thanksgiving. All respect to your mom, Linda but I’ll be using my great grandmothef’s recipe. I just had to say, though, how much I enjoyed the tangled squash in the photo it would be a shame, wouldn’t it, to cut them up and cook them! I’d like to wish all the Canadian tanglers out there a very happy and safe Thanksgiving weekend. And to those who aren’t, then whenever you celebrate, be safe and happy.